Actors have a responsible role to play in the society. Corporates have begun to look at their obligations towards their society. Amidst actors who are so confused between their social responsibility and creative liberties..(Yes..U heard it right.. I am talking about Shahrukh Khan)..its indeed refreshing to see that few actors apart from the world of entertainment..look for messages that can be sent easily to the masses through their Star Power. Aamir Khan after provoking the consciousness of Youth in his Rang De Basanti, he is now back on screen, this time focusing towards the 'stars living on earth'. My guruji used to say...We in the process of becoming intelligent lose our innocence gradually. We were all born with lots of innocence. However with all the machinations in this world, we gradually bartered our innocence with anger, jealousy, frustration and loads of stress. Whats even intriguing is that (out of jealousy probably..) we are not letting the lovely, innocent children lead simple lives. Parents thrust their dreams in their children right from the day their children are hardly ten years old. Last year, I remember meeting a parent in a music school who had come to enroll her daughter. While she was made to sing her first music lesson, she quickly tells me what she is looking forward. She tells me that she will participate on Little Masters Musical show and then later will go for Ragamalika musical show and movies. I could hear the child's straining vocal chords as a background music for her mother's future plans.. Poor gal..what all troubles will she be made to endure ?? The problem lies on the educational system on the whole. Our educational system can be simply named marks system. 'WITHOUT MARKS THERE IS NO FUTURE' is the loud message we give to the children..n this is shown beautifully in the movie where the parents lose their brains out when they realise that their kid is not the complan boys kind who faithfully finish the homework sippin complan..this kid throws his homework to the street dogs. He is fascinated by small things happening in the world. Kudos to Mr. and Mrs. Amole Gupte for devoting their heart and soul in this project. We too begin to look at the small things of this world as Ishaan looks at them with his amazing imagination and creativity. Those small attention to details reminded me of the lovely movie Amelie, wherein similar protagonist derives pleasure in noticing the unconventional stuff like dropping of the paint from the street painter's brush n stuff. Every paintings painstakingly created by the husband-wife duo show the commitment they had in this project. Today I read in the Sunday Magazine regarding their journey towards the making of this movie.. Its evident that they had done ample amount of research. While they were enlightened of the problems faced by the children, they ensured that they didnt stand against the concepts they are trying to promote in the movie. This move realy impressed me. The four finalists who were selected for the screening of the role of Ishaan were given appreciation certificates by Aamir Khan and Amole Gupta. I want to get to the present issue regarding creative liberties and social responsibility. In a country like ours where the difference between actors' role on screen and off screen is blurred, actors should be very responsible. They make huge impresssion in impressionable minds and adults alike. Actors should take care on how they project themselves on screen. Its indeed shameful to see king khan behavin like one hypocrite making contradictory statements and making a fool of himself. Remember Amitabh Bachchan's Polio Campaign which was telecasted in TV..On a similar route Aamir's Campaign for dyslexia has worked very well and now parents are looking at their children with more sensitivity. Schools should also take a lesson or two from the movie. Schools determined to show 100 % results literally squeeze the students to perform well. UNit tests, Special tests et al ruin the playful nature of the kids. Kids are made to stay late evenings in school and by the time they go home, they only think of playin some time in PS III or catch up with Nickelodeon..No body thinks of goin out to play..No wonder we find obesity levels rising amongst kids. Recently when I had been to Singapore, I interacted a lot with my cousins' kids who are studying at Singapore American School. The kids were intellectually far superior to their peers who could be in chennai. one of them, tara 13 years was preparing 4 Model United Nations. she discussed about the North Korea situation with such aplomb, that I found it hard to believe that I was talkin to a 13 year old. MY point is other educational systems as per my observations let children express their potentials. However our system gives little room to express one's talents.. The educational system in Chennai as per my observation gives competent students a choice between Engineering and Medicine. Those who are not so good in academics end up taking up Arts. ARTS suffers a serious image breakdown in South. 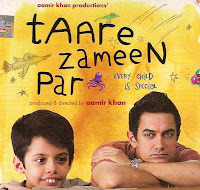 These perceptions should change..Children should be let to choose their profession based on their interests..Aamir Khan deserves applause for taking such a contemporary subject and handling it with utmost sensitivity and care.. Wish all actors take a lesson or two from Aamir..